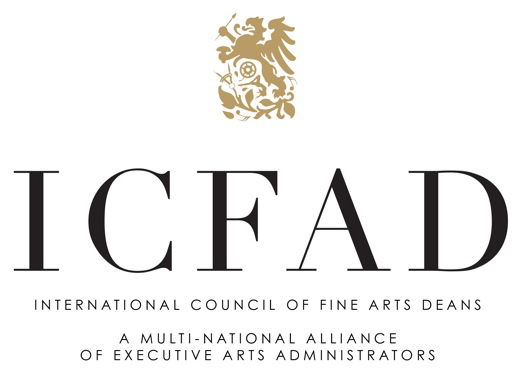 The International Council of Fine Arts Deans (ICFAD) is a professional organization through which members share information and ideas that enhance the leadership of Deans and Associate Deans, Provosts and Associate Provosts, University Presidents, and other Arts Executives in Higher Education. Founded in 1964, ICFAD is comprised of more than 400 arts deans throughout North America and around the world. ICFAD is the only organization focusing exclusively on issues that impact Arts Executives in Higher Education. The collective buying power of the Arts Executives who compose the ICFAD membership is substantial. These leaders are responsible for specifying products and services and directing billions of dollars to a multitude of arts-related products, services, and facilities. Our members represent the leading institutions of higher education for the visual, performing, and media arts. Your message will reach several hundred institutions on a regular basis, as we promote our Conference, from the time of your advertising commitment through the October event. Your company can share its marketing message about your products or services. Your institution can share information with other institutions about new degree programs, productions available, and more. Book is spiral bound, so any type that is outside the live area may get cut off or punched during production. For a printable Ad Rate Sheet for the Program Book to be distributed at the Annual Conference, please click here.